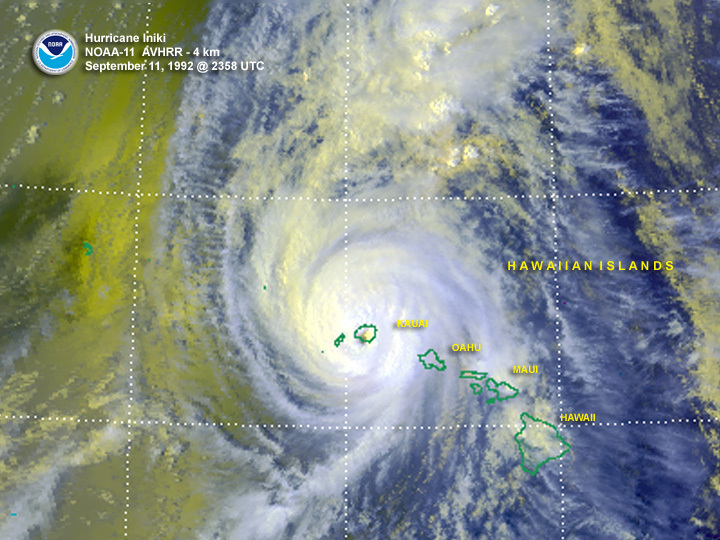 Hurricane Iselle continues to approach the Hawaiian islands. Dry air seems to be keeping its distance. Another hurricane lurks to the east of this cyclone. A Hurricane Warning has been issued for the big island of Hawaii in advance of Iselle. Please see the OFFICIAL NHC/CPHC forecasts for life decisions. Hurricane Warning: Hawaii County…winds of 75 mph or greater are EXPECTED within the next 36 hours! Tropical Storm Warning: Maui County…winds of 40 mph or greater are EXPECTED within the next 36 hours! Both of these systems will come very close to the island chain between tomorrow and next Monday. 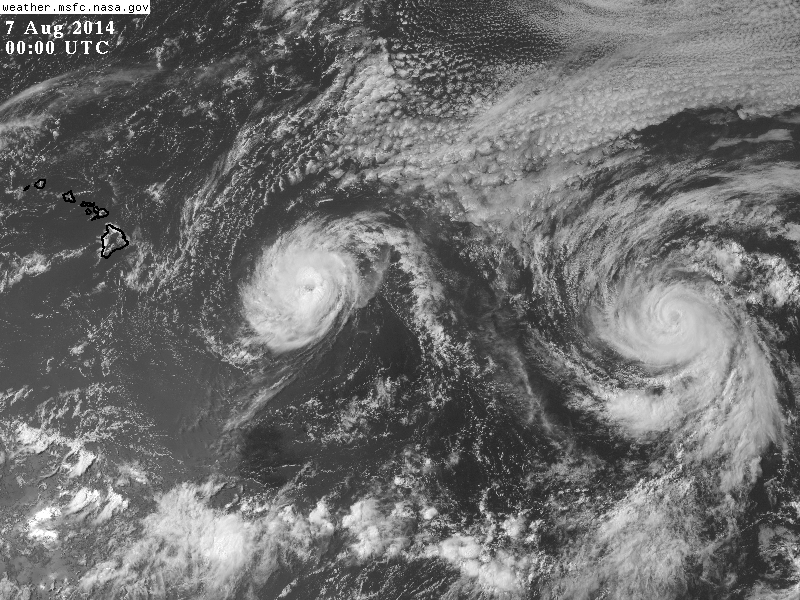 At this point, Iselle is expected to be closer than Julio on their given path. Both systems will follow a similar, and parallel, path from east to west. Conditions are expected to go downhill on the eastern islands starting tomorrow morning. Heavy Rainfall: Rainfall of totals of 5-8″ is possible Thursday and Friday on the Big Island and Maui and these rains will move westward toward the end of the week from Iselle. Much higher rainfall totals are possible on the mountains with totals there possibly up to 12″. Mudslides are possible in the mountainous areas. Flash Flooding is possible, and the entire state is under a flash flood watch. Some of these rains could last in Sunday. Wind: Winds greater than 40 mph will reach the Big Island on Thursday and move westward as Iselle moves WNW. Hurricane force winds will occur on the Big Island Thursday night and gusts will likely be higher on the mountain peaks of the Big Islands through Friday morning. Winds greater than 40 mph are likely to occur on Maui and then Oahu Thursday night into Friday. Julio could bring tropical storm force winds again on Sunday and Monday, again moving through the island chain from east to west. Seas/Surge: Water will rise 1 to 3 feet on the eastern side of Hawaii County tonight through tomorrow with higher waves. Waves could be between 6-11 feet near the center of Iselle as it passes by. Rough waters will be commonplace east and southeast of Hawaii through Monday with high seas moving through the islands starting late Wednesday and continuing through early next week. There may be smoother waves in between these two storms. Combined probabilities that winds greater than 40 mph could impact the outlined area. Winds could be much stronger closer to the center of of both systems, and these probabilities on the islands will likely go up as the systems approach the islands. Hurricane Iselle continues to reorganize after the loss of annularity, and the system is beginning to improve in appearance once again. SST’s are marginally supportive of intensification, but shear is expected to intensify as Iselle approaches the islands. Slow weakening is likely as shear increases. Julio on the other hand continues to be affected by the conditions that allowed Iselle to intensify and become annular. Slightly cooler waters and otherwise less favorable conditions with not allow Julio to intensify as much, but intensification is expected. Both systems have a considerable amount of uncertainty for the intensity forecasts. Below all of the intensity models have been compiled along with the NHC/CPHC official forecasts (OFCL/OFCI lines). The time at which each system crosses 155W – the longitude of the eastern shores of the Big Island – are marked in the dark bold vertical line. This is NOT a weekend to go out on the water in the Hawaiian islands, nor is it a week to plan a whole lot outside. Both of these systems could be deadly and should be taken seriously. It is my hope that these systems are not falling on to complacent ears and eyes. The last time a hurricane made landfall on any island in Hawaii, was in 1992 on the island of Kauaʻi. This was Hurricane Iniki, and it hit during the filming of the original Jurassic Park. Spielberg and his crew of more than 100 sheltered from Iniki during the last day of shooting. That hurricane came in from the south as most tropical systems in that part of the world do. This combination of two tropical cyclones coming in from the east is relatively rare, especially so close together. Bertha was over taken by the east coast trough this morning and is now being driven by the jet stream that makes up that trough. That makes Bertha an post-tropical cyclone. The processes for development are different, but the impacts are the same. Shipping interests in the north Atlantic may want to keep Bertha in their minds for the next few days as Bertha crosses the north Atlantic toward the United Kingdom. Take a moment and open up the slam packed united analysis above. There are 4 cyclones of importance in the tropical world in this hemisphere. One of which is about to become a typhoon in the western Pacific. Genevieve is about to cross over the International Date Line, where it will switch names from Hurricane to Typhoon. This is just a change in name and nothing more, but it doesn’t happen all that often. Posted on Wednesday, August 6th, 2014, in Tropical Weather. Bookmark the permalink. Leave a comment.